One of Sainsbury's Magazine's "20 Best Apps for Busy People"! Officially licensed and best real-time train information direct from National Rail Enquiries, who intelligently combine data from many feeds, unlike other apps that use just 1 source. ⁕ Bookmark the train that you're on, get alerted when you’re approaching your destination, and share your arrival time with friends, all from within the app! ⁕ Named as the Number One Train Info App by London24.com! Check out our 100's of 5* reviews and you will see that our many thousands of users agree! Get instant accessibility to the information you use most regularly, not hidden away like in other rail apps! Perfect for your daily commute and great for all your other rail journeys too. Take a look at the unique special features below to see why you should choose our app! Please Note : This app is not a 'journey planner' and if a destination station is selected it will only show train information for *direct* services between the two stations. Train information shown is live and is only available for trains departing/arriving within 2 hours. ¹ Platform and carriage information is subject to availability, may only be provisional and can vary from station to station. Train information is limited to stations in England, Scotland and Wales only - Live train information in Northern Ireland is not available. ‣ Unique 'Minutes Until Departure' for each train, synched to the clock provided by National Rail Enquiries' servers - ONLY in our app! ‣ EXCLUSIVE : Journey duration and arrival time at destination is shown right on each train - ONLY available in our app! ‣ Special 'Track My Train' functionality! Tap on a Train to see it's stops and live arrival times, along with the predicted position of the train! Bookmark it and text, message or mail your friends and loved ones your arrival time, all from within the app! ‣ Use 'My Train' to get alerts as you approach your station, or a few minutes before you were due to arrive. ‣ See trains for your closest Favourites immediately on launch and set up Regular Journeys to easily access your Favourites direct from the lock screen at your usual travel times! Only available in OUR app! ‣ Choose icons for your Favourites from a set of over 50 predefined images! ‣ If you live/work between 2 stations, optional alternative To/From Stations can be specified, so you can see departures from both stations combined! ONLY in our app! ‣ Access to the most mobile-friendly Live Service Update pages for each Train Operator! ‣ And loads more exclusive and exciting features to come! We pride ourselves on the quality of our apps, and think the reviews speak for themselves. 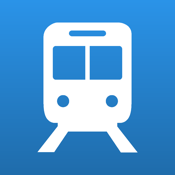 This app gets its data from the National Rail Enquiries Live Departure Boards service. Please be aware that, although being the most accurate information available and generally very reliable, this data may be subject to occasional inaccuracies or downtime, over which we have no control. This is not specific to our app and affects all rail apps in the same way. If at some point you encounter a persistent issue with the service we do have access to technical support from NRE. For these and any other issues you may have, you can contact our support department through the About tab on the app. We read and respond to all requests and will always do our utmost to help.